How to unfreeze frozen dumplings market after WF exits TW? Wanchai Ferry’s announcement on its withdrawal from the Taiwan market has shocked frozen dumplings market. By the end of July 2015, Wanchai Ferry’s announcement on its withdrawal from the Taiwan market has shocked frozen dumplings market. Nine years ago, Wanchai Ferry came to Taiwan with its high-end frozen dumpling to set up local factories. It was positioned as high-quality and premium, and also strongly emphasized homemade taste, thin, filling more, juicy and rich in flavors. Wanchai Ferry not only created a premium segment in Taiwan frozen dumplings market, it even successfully undertook the consumers who switched their eating-out expenses to in-home consumption and grew business in 2008 financial crisis. Its impact still exists until now. When the sudden news of its leaving is released, what kind of impacts and influences will it bring to future Taiwan frozen dumplings market? Kantar Worldpanel Taiwan has observed Taiwan food market for a long time and understands deeply in regards to the development trend, brand competitive landscape and consumer preference movements in frozen dumplings market. 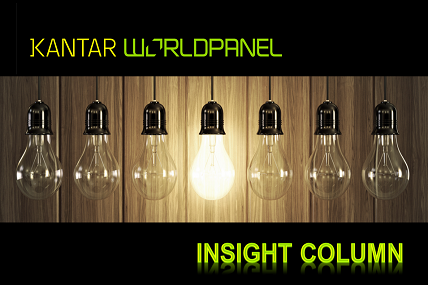 Therefore, Kantar Worldpanel Taiwan would expect existing or potential vendors in frozen dumplings market can grasp market trends and utilize new ideas and new approaches, not only to attract the original Wanchai Ferry’s buyer, but also to offer better products to facilitate the overall market growth. Taiwan families prefer pork cabbage dumplings, and it has accounted for 65% of value in frozen dumplings market as a stable leading flavor; the second flavor, pork leek, occupied 17% while the third flavor, vegetarian, grew up from the previous year of 5% to 7%. In the recent year up to the second quarter of 2015, Taiwan frozen dumplings market consumption is around NT$ 2.1 billion; however, this market is gradually losing its consumers due to the prosperity of restaurant take away business and fresh food provided by convenience stores. Kantar Worldpanel has further pinpointed that, if we segment the frozen dumplings by price, it is found that the decline of frozen dumplings is actually driven by low price tier products; and high price tier ranges maintains quite well and gaining more value importance in the past few years. 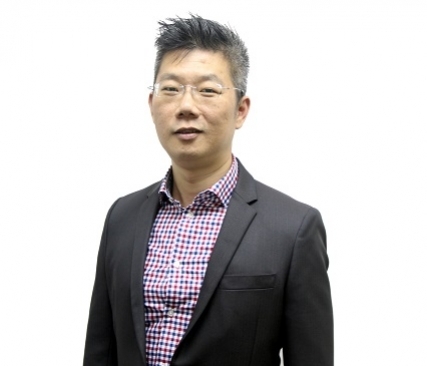 Mr. Jon Yin, Account director of Kantar Worldpanel Taiwan, said, it is true that Taiwan consumers are relatively conservative due to the concern of food security in recent years; however, they are not simply pursue cheap goods; on the contrary, they are more willing to pay higher for a better quality food to ensure it is not harmful to their health. The finding is the same in frozen dumplings market. 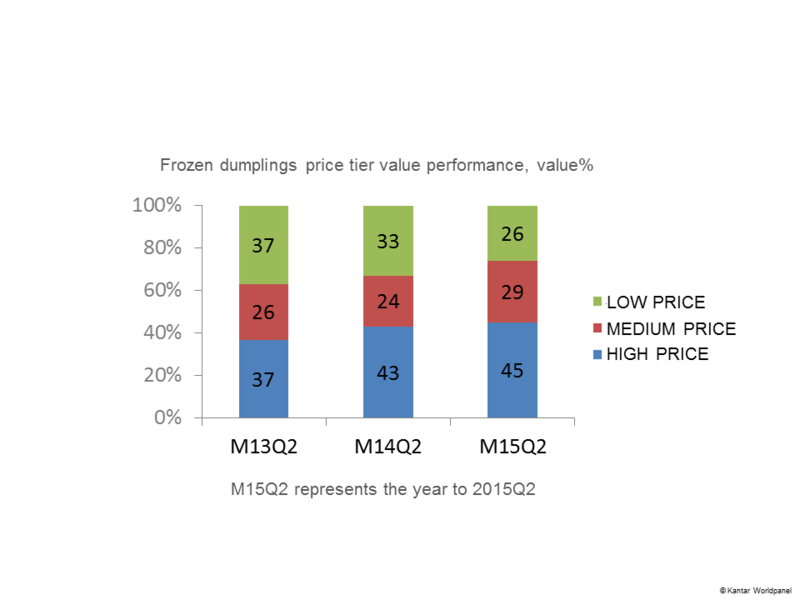 In recent three years, high price tier frozen dumplings (Note 1) has gradually gained more value share and reached 45% this year; its actual sales value has also increased by 10% comparing with the year of 2013. On the other hand, low price tier frozen dumplings lost value share year on year, drop from 37% to 26%, as a result of price inflation and the trend of consumption upgrade. Thus, a product which can deliver peace of mind value to consumers should insist high quality performance in every business stages, from the selection of raw materials to production and delivery, aiming to let consumers feel secure. This is obviously the critical winning strategy in current Taiwan food market, and this approach can further help frozen dumplings to compete with restaurant take away business and fresh foods in convenience stores. Kantar Worldpanel Taiwan indicates that the key purchasers for frozen dumplings are older families and adult families(Note 2), mainly because of its convenience. It can be served within few minutes which certainly help busy parents or couples to ease the burden of preparing a meal. In addition, the contribution of high-income families (monthly income over NT$ 100,000) is getting higher in frozen dumplings market which can also explain the growth of high price tier frozen dumplings. In summary, it is necessary to target older families and adult families in advertising or marketing communication to attract their attention. FMCG channel leader PX Mart and Hypermarket (includes Costco) are more important to frozen dumplings market than they are for other food categories. As they occupied over 70% of market value share, it is no doubt that the frozen dumplings manufacturers must have good control on those channels. Furthermore, given the fact that food security and health topics are hot in recent years, Kantar Worldpanel Taiwan has noticed that the non-traditional channels (for example: direct sales, health food specialty store, on-line store) which mainly sell organic or imported frozen dumplings have been gaining share. Although the size of business is still small and the brands are niche, it is worth paying attention to their future development especially for the manufacturers who wish to target high price tier segment. 2016 spring is approaching; the crucial challenge of frozen dumplings manufacturers is how to win the previous Wanchai Ferry sales. Kantar Worldpanel Taiwan finds out that, three months after the shutdown of Wanchai Ferry’s factories, among the loss sales volume, there are 40% of them left frozen dumplings market, 30% of them has switched to other brands and 24% of it was simply demand decrease. In the New Year, if any existing or potential vendors can realize how to master the three market drivers (what, who, where), to understand Wanchai Ferry former buyers’ needs, to retrieve the lost buyers and to stimulate consumer needs, then it would be able to take over the past Wanchai Ferry’s territory in frozen dumplings market! Note 2: Older families are the families with kids aged between 10 to 20; Adult families are the families which all family members are above aged 20.